...I'd probably be wearing my Uggs because it has just been that kind of cozy weather lately. ...I'd probably order a vanilla-peppermint latte because it is like Christmas in a cup. ...I'd probably tell you about how I am currently applying to colleges and how I am nervous to turn in my portfolio in January, since that is what will ultimately determine whether or not I get in. ...I'd probably gush about how excited I am for Christmas and how I am trying to convince Dai to let me decorate his house and get a tree since I can't really decorate the place I'm living at. ...I'd probably tell you that I'm glad I took a break from blogging, but that I am really loving being back at it. ...I'd probably tell you about our travel plans for the holidays and how I am really looking forward to a nice break from everything. ...I'd ask you how your family is doing and what your plans are for the holidays. ...I'd probably tell you that it has been really difficult to resist the urge to not listen to Christmas music, but that I am really trying to hold out until after Thanksgiving. ...I'd probably tell you about how I am on the hunt for a new pair of brown leather boots since I had to finally toss my favorite pair. ...I'd probably ask you what's on your Christmas wish list because it is fun. ...I'd show you a recent photo or two of Marly because I am just that kind of dog mama. ...I'd tell you about the projects I've been doing in my design class and how I am a little overwhelmed with school in general right now. ...I'd probably ask you if you want to bake Christmas cookies with me because it would be nice to have a gal pal to do that with. ...I'd probably tell you about how I've been practicing writing with a brush and ink, and probably show you the new blog header I made by doing that! So, your turn. 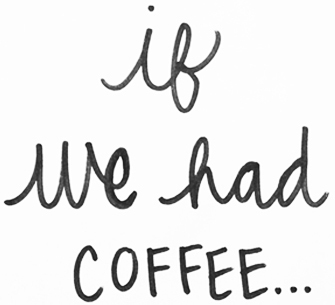 If we had coffee, what would you probably tell me?